Will Barbara Bush Change Her Name After Marriage? Barbara Bush and Craig Coyne just got married in an intimate wedding in Kennebunkport! She is the second daughter of former President Bush to tie the knot, and we’re curious with her iconic name if she’s going to change her name or keep her maiden name. As name-change experts, we’re curious if Barbara loves her current name or if her marriage will give her the opportunity to take a new name and almost a new identity separate from her grandmother. 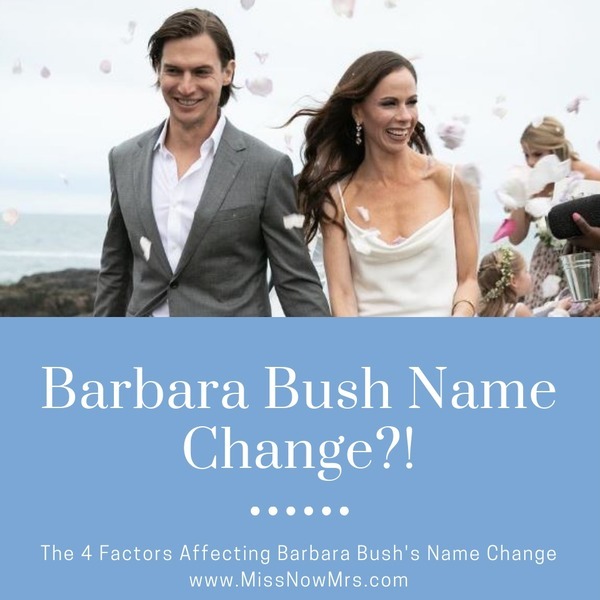 Let’s examine the four main name-change factors that may influence Barbara’s married name change decision. In the context of name change, the older a woman is at the time of her marriage, the more likely she is to keep her maiden name in some way. Barbara is currently 36, an age that usually correlates with women keeping their maiden name. The more degrees a woman holds, again the more likely she is to hang onto her maiden name. Ms. Bush graduated with a degree from Yale, which has us thinking she will keep the name that is associated with that prestigious degree. If a woman has a career that relies heavily on name recognition, such as being a doctor, lawyer, or real estate agent, she is less likely to change her name after marriage. Barbara is the co-founder of a large non-profit and of course the daughter of former President George Bush. Her name is very tied to her work and activism. Family tradition can heavily influence a woman’s married name change decision. Barbara’s twin sister option to keep her maiden name and add her husband’s name after her marriage in 2008. Becoming Mrs. Jenna Bush Hager a name-change choice that allowed her to keep her ties to Bush, but also adopt her husband’s family name. Name change after marriage is a very personal choice. While there are the known factors associated with name change influence, there are also the factors of personal style, what their spouse wants, and if they view name change as a way to show commitment. In our expert opinions, Barbara Bush will soon be Mrs. Barbara Bush Coyne. Regardless of her choice we wish her a lifetime of love and happiness… and if she does opt to change her name, we’d love for her to use the new MissNowMrs name change app! Is Hailey Baldwin Now Mrs. Hailey Bieber? !